The history books tell us that Rotary had its beginnings with the first meeting of the Rotary Club of Chicago on a cold winter's night on the 23rd of February 1905, in room 711 of the Unity Building in North Dearborn Street. In reality, informal meetings had been going on for a number of months previously to see if the idea had any merit. The same history books highlight the founder as Paul Harris, with scant mention being given to his companions. Of these, there were four in particular, only three of whom were present on that February night. They were Silvester Schiele, a lawyer, Hiram Shorey, a merchant tailor, and Gus Loehr, a mining engineer who hosted that first meeting. The actual name Rotary related to the fact that these early meetings rotated round the offices of the participants. The emblem of Rotary had a number of different forms before the now familiar wheel with six spokes and 24 cogs was adopted. Silvester Schiele became the first President of the Rotary Club of Chicago. The fifth person who was not present that evening but who went on to have a major influence in both the Rotary Club of Chicago, and the Rotary movement as a whole, was Harry Ruggles, a printer. Another who became involved later and also went on to play a major part in Rotary International as the Assistant Secretary, was Paul Harris' brother, Cecil. Paul Harris became the driving force in Rotary and was a single minded and committed individual in its promotion, but it was not always the case that he was so clear about the direction of his life. As a young man, he had a real touch of wanderlust, and travelled widely while finding it difficult to settle to the pursuit of a career. However, a number of businessmen saw his potential as a young man and helped him to obtain qualifications and work, one of the reasons why he was so committed to helping young people. The other benefit of his upbringing in America, and his travel there and in other parts of the world, was the exposure he received to the problems of society, which lead to his strong commitment to the humanitarian principles of Rotary. A defining moment in the life of Paul Harris was his marriage to Jean Thomson from Edinburgh. Jean's father came from Forfar and her mother from Peterhead. All their lives, this led to Paul and Jean retaining a strong interest and connection with Scotland. For example, their house in Chicago was called “Comely Bank” as a constant reminder of these Edinburgh links. The same strong ties resulted in our District becoming the first in Rotary – District 1. The needs of computers may have resulted in the gradual dilution of this number, first to District 101 and then to District 1010, but we still occupy an important position in the history of Rotary. Jean never lost her affection for Scotland and indeed, she returned to Scotland after Paul's death in 1947 and stayed firstly with a brother in Ayrshire, then a sister in Dundee, before finding a home of her own in Edinburgh. She died in 1963 and is buried in Edinburgh's Newington Cemetary. Rotary's popularity spread in the first decade of its existence with Clubs being formed from New York to San Francisco and as far north as Winipeg in Canada. By 1921, there were Clubs on six continents. Even so, it is sometimes quite hard to appreciate the extent of this spread to the 1.2 million Rotarians who now exist round the world. The first Rotary Convention was held in 1910, at which time the organisation was known collectively as the International Association of Rotary Clubs. The name Rotary International was only adopted in 1922. Rotary's motto of “Service Above Self” was originally that of the Rotary Club of Minneapolis in 1913, but soon became the motto of the whole Rotary movement. Rotary came to Scotland in1912 with the formation of Clubs in Glasgow and Edinburgh to be followed by Aberdeen(1916), Perth(1917) and Dundee(1921). Service to society, both at home and abroad, has always been a key part of the Rotary movement, but perhaps the defining moment in expanding such activities came with the creation of The Rotary Foundation, Rotary's own and only charity. 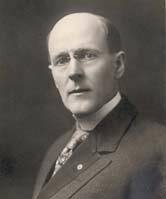 This was the brainwave of another towering figure in Rotary's history, Arch Klumph, who proposed such an organisation at the International Convention at Atlanta, Georgia, in 1917. However, it was to take another 11 years for the resulting endowment fund to reach a critical mass which allowed it to undertake a range of projects such as aid for crippled children. At that time in1928, it was renamed The Rotary Foundation, but it was only following the death of Paul Harris in 1947, which resulted in a massive influx of funds, that Foundation has achieved its full potential. The first donation in 1917 was for $26.50. Today, it receives millions of dollars every year. Since 1947, the Foundation's achievements, in terms of national and international aid and understanding, have become the stuff of legends. Few back in 1917 could have foreseen, for example, the opportunities but also the logistical problems of the PolioPlus scheme where over a million young people may be inoculated against the disease in a single day. Few would have believed that Rotary's involvement could have resulted in the virtual elimination of the disease. In other areas of concern, it is a source of quiet satisfaction that very often the first aid organisation on the ground providing practical help for the victims of disasters, such as calamitous earthquakes and the tsunami, will be Rotary. While the scale of urgency may be less, Rotary's understanding of mankind's need for and, indeed, entitlement to safe drinking water, has led to schemes in many countries to satisfy this essential for healthy living. It is this desire to do good, but also to enjoy the fun and fellowship of one's fellow Rotarians which makes Rotary perhaps the unique charity in the world. I have mentioned fellowship, but Rotary is now a dual gender organisation, the decision that ladies should be able to join our organisation being taken formally in America in 1987 and in the UK in 1989. At a stroke, this potentially doubled the numbers of Rotarians and what a dynamic and committed contribution the ladies have made to our activities. Rotary's reach has spread to so many activities and parts of the world, that it would be impossible in one short article to explain them, let alone do justice to them all. Perhaps one special area should however be singled out. This is Rotary's concern for and interest in the needs of young people. They after all are the future of Mankind, let alone Rotary. A consideration of their needs led to the creation of Interact, a dual gender junior version of Rotary for 14-18 year olds in 1962, and the creation of Rotaract(also dual gender) for 18-29 year olds in 1968. District 1010 is particularly strong in a range of other youth activities especially the Rotary Youth Leadership Award scheme. Many articles conclude with the statement, “The rest is history”. I hope that this is not the case, and never will be the case, with our Rotary movement, because the need for its existence has never been greater. We live in times of great change and Rotary is changing with this. The past 30 years have seen the disappearance of some national boundaries and the creation of others. We have seen disasters on a mammoth scale, ethnic wars and the inexorable spread of diseases such as malaria and AIDS. Last, but perhaps most important of all, there is a realisation of the damage that Mankind is doing to our planet and the implications of this for the futures of our children and grandchildren. Rotary has much to do but has always managed to come up with the people capable of leading such great endeavours. Paul Harris often spoke of his privilege to be a Rotarian and to have the opportunity to lead the movement in its endeavours . I believe that we have Rotarians today of exactly the same fibre.